Los Patrones Parkway is rural secondary highway in Southern Orange County, California. The toll-free roadway is approximately 4.5 miles in length and has four lanes, two in each direction. Los Patrones Parkway provides increased mobility throughout the region as well as easier access to major freeway and toll roads. The first phase of the roadway connects Oso Parkway to Chiquita Canyon Drive, in the north and south directions. A multi-purpose pathway trail allows for pedestrians and cyclists use of the roadway with a tension cable barrier to provide a physical barricade between the traffic and people. The project has multiple wildlife crossings under the parkway as well as a wildlife fence along the side of the road to discourage animals from traveling into traffic lanes. The slopes of the project are in the process of be mitigated and have performance criteria for renaturalization of the slopes. The project also included an overcrossing of the Los Patrones Parkway which was a two span bridge. Los Patrones Parkway addresses the need for the expansion of local roadways to handle the increase in traffic volumes in Orange County. 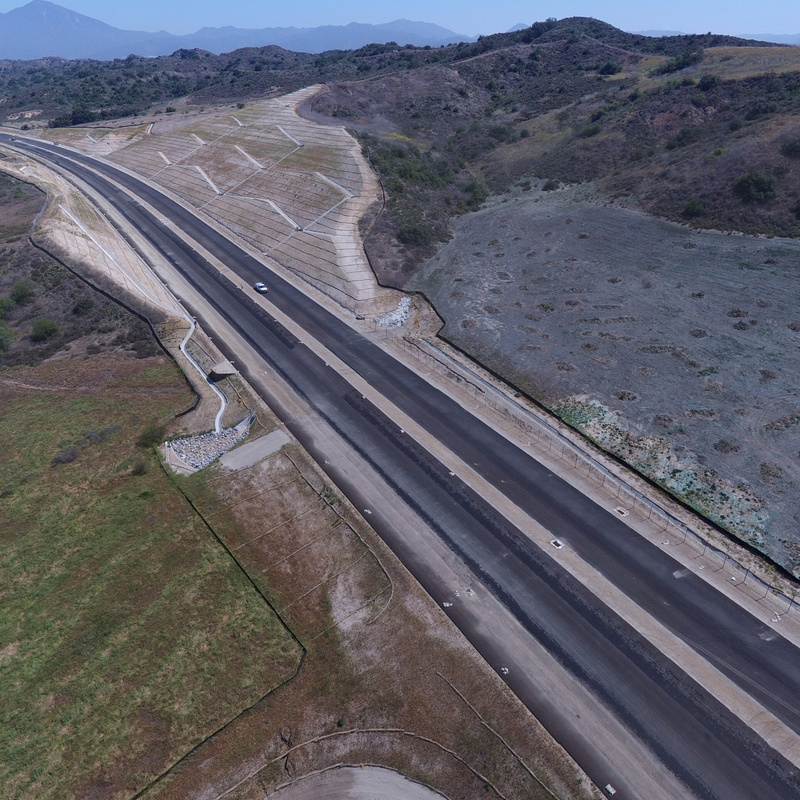 This project incorporated a 70 MPH design speed which included design standards from both the County of Orange and Caltrans. Multiple alignments were studied with environmental impacts as well as constructability used to determine the alignment. Multiple design enhancements were made to mitigate environmental impacts some of theses enhancements included water quality basins, flow spreaders at discharge points, multiple storm drain junction structures to reduce impacts to existing flowline and slope habitat mitigation. Safety concerns of traffic, pedestrians and bicyclists were at the forefront of the design and varying types of barriers where used that best suited the needs. The implementation of a non rigid cable barrier was used to reduce the traffic leaving the paved surface. The cable railings and an additional natina coating that was added improved the aesthetics of the barrier. Special consideration was given to wildlife in the area and included the installations of two wildlife tunnels . The first structure was a precast arch structure measuring 30’ wide and the bottom and 18’ tall. The second structure was a 18’ diameter circular corrugated metal structure that was backfilled to create a natural bottom. Additionally, multiple culverts were upsized from what was required from a hydraulic requirement to allow for wildlife to travel under the road through the culverts. Through the process of design and construction the was coordination with Caltrans as portions of the the roadway were located within Caltrans ROW. Additionally, coordination with California Fish and Wildlife department was required to achieve the required regulator permits. A close relationship with GMU geotechnical was required to design the side slopes of the roadway. Cut slopes and fill slopes of 100’+ were required and slope stability was a crucial part of the design. Huitt-Zollars and GMU worked in concurrence to allow for properly designed slopes while managing construction costs. Los Patrones Parkway is rural secondary highway in Southern Orange County, California. The toll-free roadway is approximately 4.5 miles in length and has four lanes, two in each direction. Los Patrones Parkway provides increased mobility throughout the region as well as easier access to major freeway and toll roads.